Another variation of the marriage of two of my favorite foods. 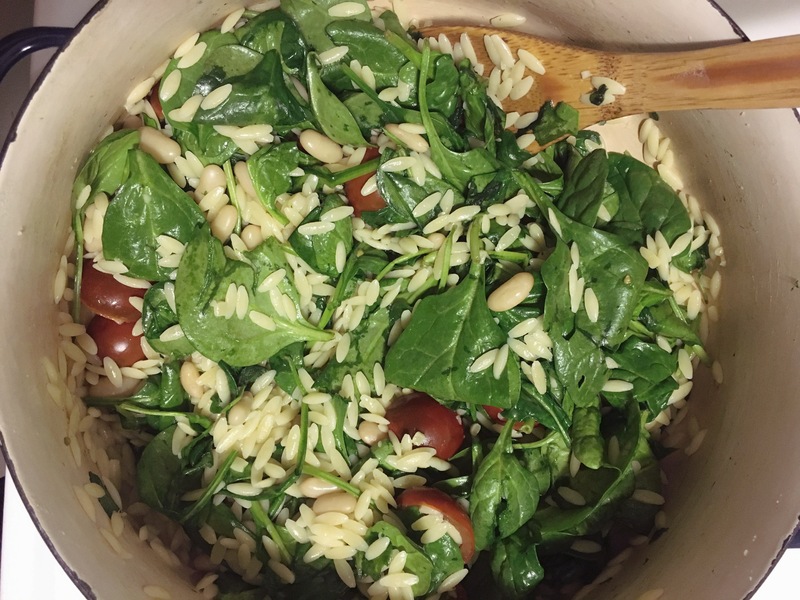 The orzo was what didn’t fit in my glass storage jar and was taking up space in a cloth bulk bag on my counter. I cooked up a vat (seriously so many) of mayacoba beans for a Thanksgiving feast I’m having for my students tomorrow and decided this would make an easy dinner. Leftover tomatoes from the thrice weekly vegetable snack we get were cut in half and tossed in after the pasta was drained. I added a couple tablespoons of butter, then spinach, garlic powder, and pepper. I used one bowl to soak the beans, one pot to cook the beans + the pasta later, and one colander to drain the beans + the pasta. I’m a huge fan of one pot / pan dinners. I’m an even bigger fan of using up what’s in the pantry & refrigerator. When I opened google on my phone, I was informed that Venus and Jupiter are crossing paths in the Scorpio sign tomorrow and the next day. I’m a Scorpio so I’ll be feeling the self-love big time and also looking forward to my week-long Thanksgiving break. It’s my favorite holiday!